Josh Gardiner of the Amsterdam Mohawks has won the 2014 PGCBL Player of the Year Award, while Jayson Yano of the Newark Pilots has been named the 2014 PGCBL Pitcher of the Year. Photo Courtesy of Corey Mansfield. 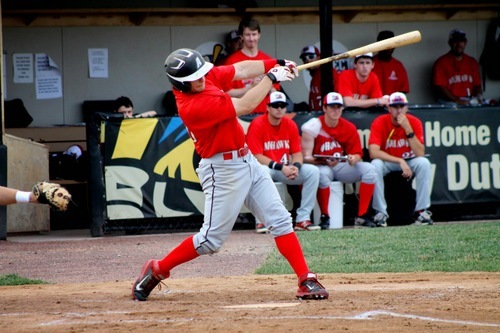 The Perfect Game Collegiate Baseball League is pleased to announce that Josh Gardiner (Radford) of the Amsterdam Mohawks has been chosen as the 2014 PGCBL Player of the Year. Gardiner, a rising senior at Radford, led the PGCBL with a .543 on-base percentage and finished second in the league with a .415 batting average. Gardiner’s .543 on-base percentage set a new league record, topping the .497 marks of 2013 PGCBL Player of the Year John Nogowski and the 2012 PGCBL Player of the Year Ross Kivett. Outside of batting average and on-base percentage, Gardiner finished in the top five among the league leaders in five other offensive categories. His .511 slugging percentage was tied for fifth, 56 hits were fourth most in the league, 29 RBIs was fifth, 10 hit by pitches was first and 29 walks was second. He stole 16 bases in 21 attempts, which was tied for seventh in the league. Gardiner, who hit in the three spot and manned second base for the record breaking Amsterdam club, led the Mohawks in six major offensive categories: batting average, on-base percentage, hits, total bases (tied with John Razzino), walks and hit by pitches. He finished in the top five in all but one category, home runs (1). Amsterdam, which set a PGCBL record with 36 wins, has advanced to the PGCBL Championship for the fourth consecutive season. With runners in scoring position, Gardiner hit .411 (23-for-56) and he had 13 2-out RBIs. In 13 opportunities with a runner on third and less than two outs, Gardiner drove in the runs 54% of the time. He also struck out just twenty times in 135 at-bats. On July 29, he drove in six runs, most in any single game in the PGCBL in 2014. Defensively, Gardiner committed just three errors and finished with an even 100 assists on the season (sixth most in the league). He was also a part of 17 turned double plays. The Culpepper, Virginia native was named the PGCBL Player of the Week for Week Four, which spanned from June 26 through July 2. During that week, Gardiner went 10-for-19 on the week with five RBIs and two doubles. He walked six times and posted an on-base percentage of .654 over the week. At Radford this season, Gardiner hit .294 with 37 RBIs and 51 runs scored. He also clubbed 13 doubles and posted a .415 OBP. He made appearances in 55 games and started 54 of those contests. Gardiner drew 33 walks and committed just five errors, good for a .977 fielding percentage. This is Gardiner’s second season with Amsterdam. For the defending PGCBL champions, he hit .327 in 44 games (42 starts) and had a .466 on-base percentage. Gardiner slugged four home runs in the summer of 2013 and drove in 33 runs, which was tied for second on the Mohawks. The Perfect Game Collegiate Baseball League is pleased to announce that Jayson Yano (Stevens) of the Newark Pilots has been selected as the 2014 PGCBL Pitcher of the Year. While Yano held all batters to a .221 batting average, he was particularly tough on right-handers, who went just 12-for-58 (.207) off him. Yano made nine appearances overall, seven of those being starts. He averaged 5.93 innings per game and less than a walk a game. In game two of a doubleheader against Glens Falls on June 18, Yano tossed a seven inning complete game and allowed just one run while striking out five. One of Yano’s two losses came on June 23 against Watertown. In the loss, Yano still tossed a complete game, struck out eight batters and gave up just one hit. On July 1, Yano tossed a nine inning complete game and allowed just one run against the Albany Dutchmen for his third win of the season. The right-hander picked up two more wins on July 7 and July 12 before taking the mound against Elmira on July 19. Against the Pioneers, Yano tossed a complete game, allowing one run (unearned) while striking out seven, walking just one and allowing four hits. Newark won the game 7-1 and wound up winning the division by a game and a half over Elmira. At Stevens this year, Yano went 5-3 with a 1.62 ERA in nine starts. He struck out 46 batters in 50 innings and opponents hit .232 off him. Yano also played in 42 games in the field for the Ducks. He was the team’s leading hitter with a .342 batting average and posted a .387 on-base percentage. For Newark, he made five appearances in the field and hit .250. For more information on the Perfect Game Collegiate Baseball League, visit www.pgcbl.com.